If you read my posts on even a semi-regular basis, you know I struggle with peelies. 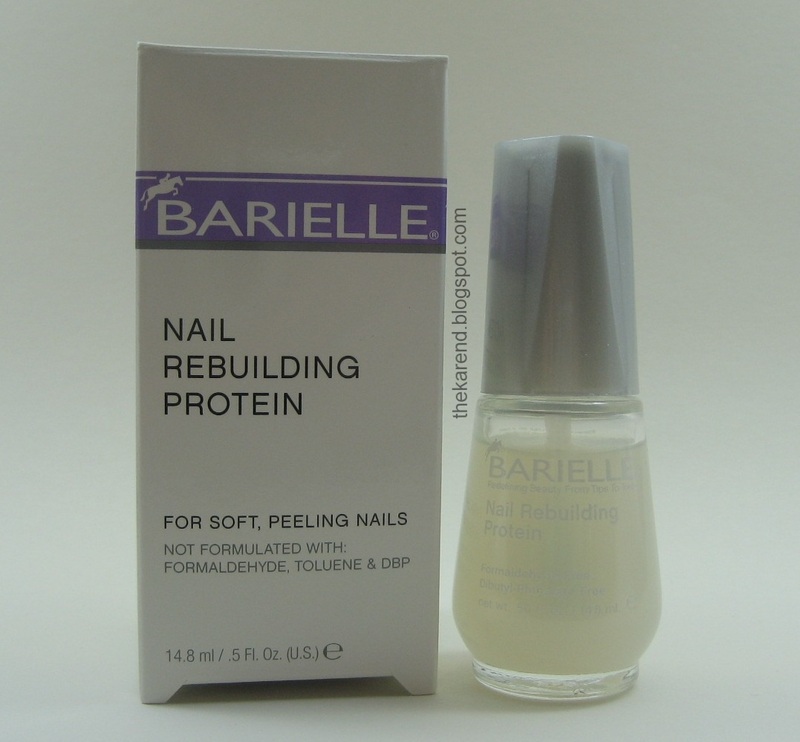 So when Barielle sent a bottle of their Nail Rebuilding for me and Lucy to try, I was quite interested to see if it might help me. I didn't crop my thumbnail out of that photo because I'm pleased to be able to show that it's as long as my other nails, instead of being shorter because I've had to cut it down to remove damage. My right thumbnail, which is usually even worse because I'm right handed and just can't seem to stop using that nail as a tool, is just as long. I'm not sure the last time that was the case; it's been quite a while. I'm quite pleased with how this treatment is working for me, so much so that I bought the PRO version at Sally Beauty for myself when it was time to send this bottle along to Lucy. I know not every treatment works for every person, but this one sure seems to be working for me right now. 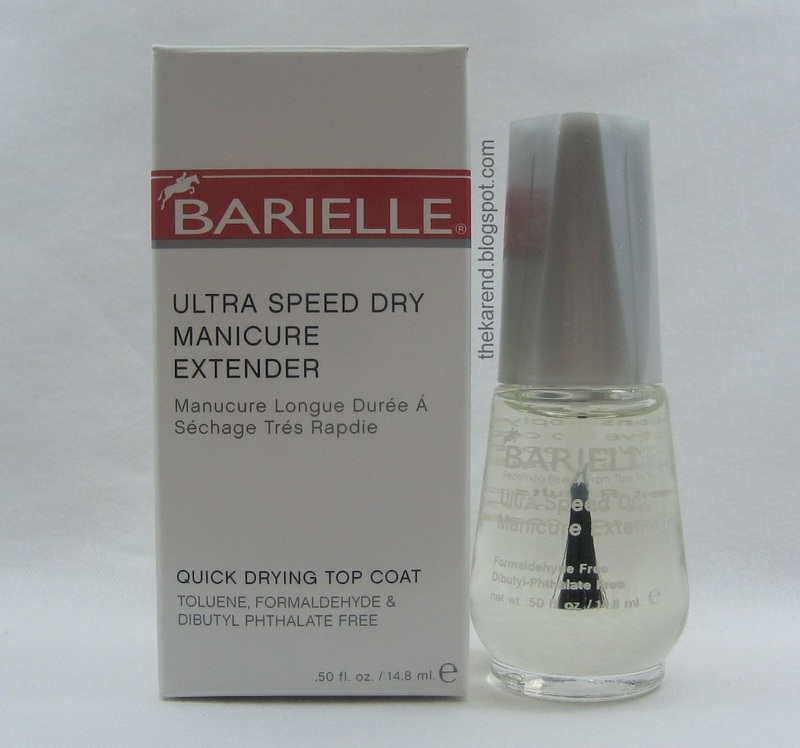 Barielle also sent their Ultra Speed Dry Manicure Extender for a tryout. I didn't use this as much as I did the treatment, but when I did use it, it worked fine. The consistency is thinner than what I'm used to using, but that didn't seem to affect its longevity. I never did try it as a manicure refresher since I don't tend to keep my polish on long enough to need refreshing. 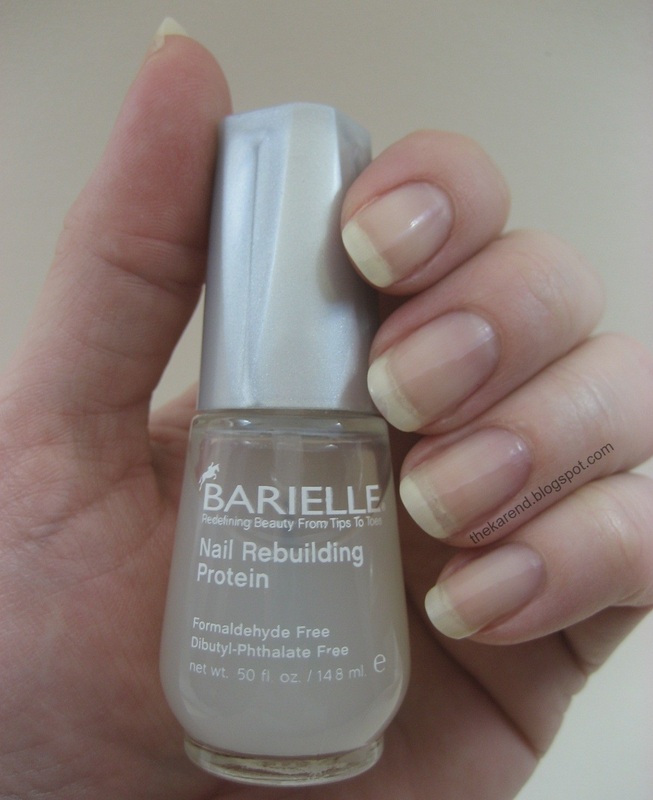 The Ultra Speed Dry Manicure Extender is $16.00 on Barielle's site, and the Nail Rebuilding Protein is $17.50. I have the feeling that they would last a while; that first photo shows the bottle after I'd used it at least nine or ten times (probably more). The treatment and topcoat shown in this entry were provided free for review purposes. The content of the entry was not dictated by the provider. Wow if this product works it my solve the problem of many many laquer lovers :) I'm currently trying Essie all in one Base (I think) for I have the same problem as you do AND my nails break quite easily; if it does not work after a couple more weeks I might try Barielle's magic potion! Anyways I'm happy it worked for you! I have nail peelies, too! I thought perhaps leaving them polish free for a while might help, but I think I do have to move on to treating them in some manner. Sigh. I don't particularly like the look of these bottles, they look a bit old-fashioned. Have you tried Mavala Scientifique for peeling areas? 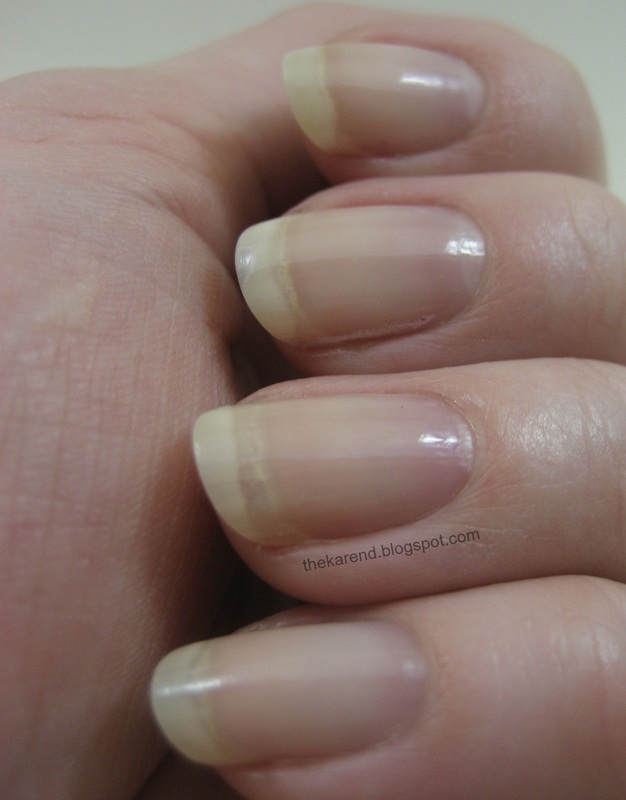 I'm lucky that my nails only peel if I bump into something or if I haven't taken vitamins in a long time. Viktorija, no, I haven't tried the Mavala. That brand isn't around many places I shop; I've seen it in person only once. Thanks for the insight..I may have to give this one a go. I, too, have TERRIBLE peeling nails, to the point where they simply will not grow much at all. Mine typically don't even grow as long as yours are here before they break or I have to cut them off from damage. thanks for the review! ill have to check this out, i get bad peelies too! Wow so glad to hear the treatment is helping! I hated it when my nails were pealing...your nails look really great right now! I've been using this for a little more than 2 months, as a base coat under color like you have, and I have also seen improvements! I am delighted to have found it in at TJ Maxx where I paid less than the price you quoted, though. I also found the manicure extender at TJM but haven't tried it yet, also due to not having a long term mani. These show up occasionally at Winners...I've haven't used the protein but sometimes reach for the extender. I just bought both of these in a duo pack for like $8.99 at TJMaxx! How cool that you did a review on them, thanks so much! I've been looking for a new nail protein. I saw some Barielle products at my Sally's Beauty Supply. Maybe I can pick one up to try. Nailtiques for me has been a bit more expensive. I still swear by my Trind and when I first started using it over 3 yrs ago-I did go a whole month doing daily removal and reapplying-but now just use as a base coat. I did just have a massive break and will be cutting them down to nubbins this afternoon.